Amber was absolutely fantastic. Cool calm and collected she helped me get my head around the small change in location due to rain and it could not have been more perfect. She made everyone feel relaxed and at ease (especially me). I could not recommend Amber enough. Perfect celebrant for our perfect day. Amber helped make our special day a whole lot more personal and enjoyable. Right from our initial meeting, Mitch and I knew Amber was perfect for us! Her bubbly and organic nature made us feel like she truely wanted to know more about us, and we felt confident she would do the job justice. No matter our request, Amber made everything achieveable which was fantastic as we really wanted a personalised ceremony. She even went out of her way to send us further suggestions, and examples. 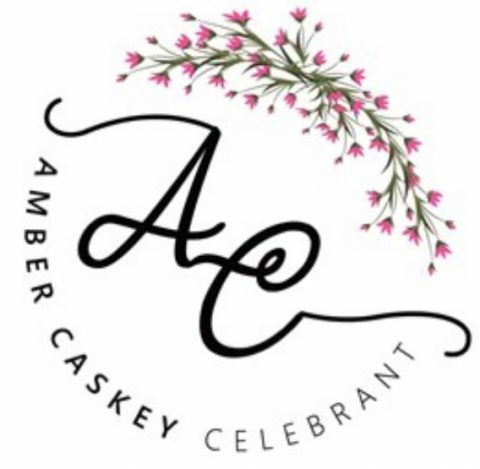 Amber ensured our process with her was clear; we knew exactly what she needed from us and we knew exactly how she would proceed with the ceremony. On the day, Amber was timely, well dressed and handled our guests beautifully. She presented our vows on beautiful cards – colour coded to with our theme, which we now have in our album. We thoroughly enjoyed Amber’s service and would recommend her to anyone, hands down. Thank you so much Amber! Thank you Amber for helping to make our wedding day so special. We very much appreciated your sensitivity and guidance during what was a very happy, but also difficult time for our family. Your professionalism and kindness will not be forgotten. Amber was absolutely amazing she helped with ideas for our ceremony and made things simple and amazing! thanks again Amber! Amber is so friendly and down-to-earth yet ultra professional and full of personality! The whole package! We loved our time working through our ceremony details and it really felt like she understood what we wanted and that translated to our ceremony which was just incredibly special. Thank you so much Amber for every thing you did from our first meeting through to the follow-up after the wedding, we can’t thank you enough. Back from honeymoon now so wanted to drop a note here to say a huge thanks to Amber. You made our wedding great. You made the planning seem stress free despite a few hiccups. And most of all you made our day fun and very special. Again thank you so much. Thank you very much for officiating at our wedding Amber. So very lovely to meet you. Thank you for helping me and Paul. It was such a special, intimate and blessed day. Amber was amazing to deal with! Very reassuring, helpful and patient with us while trying to help us decide on how we wanted our wedding ceremony to be. She provided excellent examples for readings and vows and this made the whole planning process smooth and stress free! On the day our ceremony was exactly the right mix of humour, our personalities and formalities! Thank you so much Amber! Excellent celebrant. Easy going, stress free and she was so helpful with everything. Thank you for making our day special Amber! !